PushWrapper – A new stretch wrapping concept from the Lamiflex Group. A full plastic packaging concept. 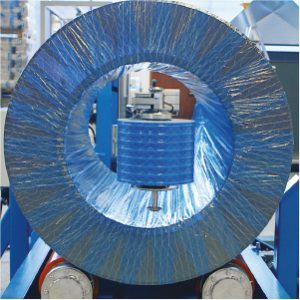 The PushWrapper concept consist of a tailored plastic packaging material coupled with a new simple, but robust machine for wrapping steel or aluminum coils. Easily operated by one person, but can easily be scalable if more capacity is needed. The PushWrapper is en entry level, scalable machine that works with a “hand over” technique, using arms that complement our range of more advanced machine solutions. The concept is unique (patent pending) and makes it very easy to start with plastic wrapping material, compared to alternative machines that need large investments, planning projects and infrastructure. If more capacity is needed, it’s simple to supplement with additional machines. Two people can easily run four machines. Cras ultricies mi eu turpis hendrerit fringilla. We believe that Lamiflex group global experience in combination with our local entrepreneurial drive is a winning combination. The Lamiflex Group is a world leading supplier of transport packaging solutions mainly in the steel, aluminum and cable industries. Our products include materials, machines, services and process improvements with methods and tools to develop and implement the optimal packaging solution and processes for packing. We provide the market with complete solutions including services for recycling or reuse of products or product systems. The Lamiflex Group is headquartered in Nyköping Sweden but the group is globally represented by employee based subsidiaries, as well as, exclusive partnerships in many different countries. Lamiflex does not believe in running business and setting environmental targets in different forums. We believe that efficient solutions are both good for the environment and business in general, and using bio- or recycled material, environmentally friendly chemicals and keeping energy consumption and waste to a minimum will reduce the risk in regards to future pricing and political changes going forward. The Lamiflex Group offers challenging and exciting opportunities at any one of our world wide packaging companies. We are looking for talented people to be a part of our team and help us build our future products and solutions. Explore our current job opportunities and take the next step towards designing your future.